I confess, I am a travel harlot. Each time I journey to a new locale, I capriciously give my affections away. It doesn't matter if I am traipsing over the wild Yorkshire Moors, sipping lemoncello by the sea in Portofino, listening to the wind rattle through a bamboo forest in Arishiyama, or devouring Tex-Mex beside a trailer in Austin, I fall in love as easily as a tweenie-bopper at a Justin Bieber concert. No matter the adventure (or, misadventure as is often the case), I always find something to adore. That one thing that becomes, for me, synonymous with the place. It might be a restaurant, park or museum. Sometimes, it's just one moment. One perfect, vivid travel moment painted upon the canvas of my mind. A masterpiece to be privately admired over and over again. I call it "looking for my dragonfly moment." I coined the phrase several years ago, after a series of unfortunate events lead me to South Korea. I stepped off the plane and into a fetid cloud. The air in Songtan as thick and putrid as the inside of a kimchi pot. A cacophony of thundering jets, screeching automobiles, and miserable humanity assaulted my ears. I went to bed that first night feeling irritable and negative. All of my senses were engaged in hating my surroundings. I woke late the next morning, still gritty-eyed and groggy from the disorienting sixteen hour flight, to find the fog and my malaise had not lifted. My first thought was, "I hate Korea." I'd had my feet on the ground for less than twenty-four hours yet my mental compass was determinedly fixed to "HATE." I decided to go in search of sustenance. My first step kept me headed in the direction of loathing. Outside my apartment, I stepped on a slimy green patch of concrete that nearly sent me head over Converse. (I would learn that the sewers in the area were too shallow to accommodate the waste and frequently backed up, belching offal that would ferment on the sidewalks). Keeping my Converses cruising, I navigated around the slick spots, peering through the fog, until I came to a small park. Ahead stood a most unusual tree. With branches laden with short pine needles growing in tufts and blue pine cones, it looked like something Dr. Seuss would draw - if he had been chosen to illustrate Mulan. Exotic. Beautiful. I was standing alone in the park, staring up at the oddly Asian tree, when a single dragonfly appeared in front of my face, fluttering its diaphanous wings with an almost undetectable whir. It hovered there, staring at me staring at the tree. Then, a swarm of dragonflies descended, flying around me as if characters in an animated film, sent to cheer the hapless Princess. I listened to the whir of their wings and something miraculous happened. I felt my compass begin to turn away from hate. I would never truly appreciate Korea, but that single moment - that dragonfly moment - became a symbol for me. It was a perfect travel moment - a brief, fluttering moment of beauty and acceptance. "Look for the dragonflies" has become my mantra. No matter where Fate tosses me, I know there will be at least one memory I will take with me to love, to cherish. In South Korea, it was the dragonflies fluttering on a foggy morning. Sometimes, I am fortunate and Fate tosses me somewhere splendid, somewhere with loads of backdrops for perfect travel moments. A place filled with temptations that have me falling in love again and again. 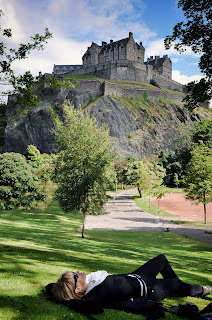 It was my second trip to Scotland but my first to Edinburgh. I landed during a torrential downpour. The airlines "displaced" my luggage (Cheers, British Airways!). The taxi got a flat tire. My expensive hotel room was located between the stairwell and the lift and, inexplicably, smelled like my grandpa's house on Saturdays (Gramps, a retired cop, hosted beer, brats, and sauerkraut feasts for his German and Irish cop buddies every week. Fifteen men in a Depression-era bungalow sauced up on kraut and brews makes for one odoriferous environment. Just sayin'.). Not an auspicious beginning to my Grand Highland Adventure. I abandoned the butchered comforter. Surrounded by a swirl of goose feathers, I ventured beyond the confines of my over-priced hotel to go in search of my dragonfly moment. soldiers in a straight line. 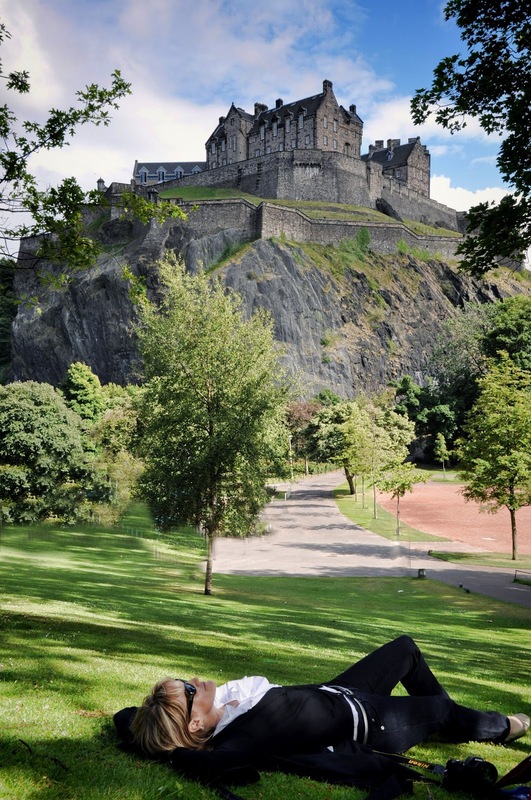 I started at Edinburgh Castle, where I learned a wee bit about the fierce battles and political rivalries that scar Scotland's brawny countenance. After the tour, I stood on the battlements and admired the city below. The rain had stopped. The sun had returned triumphantly, like Lady Godiva in all her splendid golden glory. In the distance, the Bay spread out like a shimmering blue cloak. I descended the battlements and began my walk back toward Deacon Brodie's, a colorful pub I had spied in the heart of Old Town. I was walking down High Street when I encountered a cluster of tourists watching a street performer. 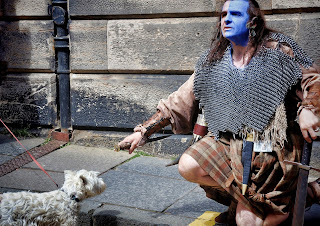 Dressed as William Wallace, he was swinging a sword through the air while delivering a rousing speech about the need for his countrymen "to stand in defiance of tyranny." I am not usually one for blatant, cheesy tourist attractions, but something about this performer's impassioned delivery captured my interest, so I remained with the throng of giggling, tennis shoe-wearing tourists. 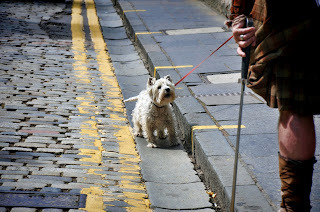 I watched as a woman walking a West Highland Terrier struggled to keep hold of her lunging animal. The terrier broke free from its master's hold and charged up to the street thespian, tail stiff, growl rumbling deep in its furry belly. Undaunted. Terrifying in his dogged determination (pardon the pun). Without missing a breath, the thespian lowered his sword and said, "Be gone with ye, ye wee mangy beast, or I'll gut ye as sure as I did the English." 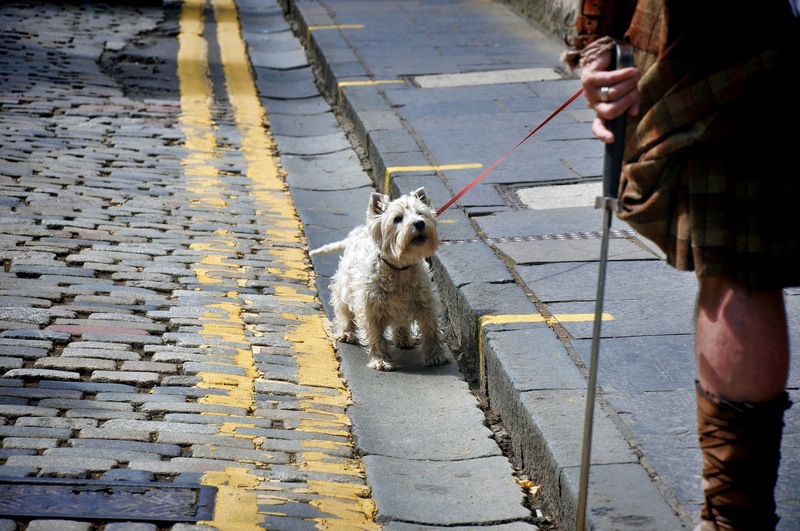 The dog's embarrassed owner seized the leash and tried to pull her barking canine away but the Westie had dug in and was determined to see his battle through. The blue-faced thespian made a few more quips. The crowd laughed and tossed coins into his bucket. The thespian dropped to his knee and continued to beseech his countrymen to fight the snarling tyrants. The metallic cling of coins dropping into the bucket confirmed what was already obvious - several of the tourists (especially those in the young, female demographic) were lapping this scene up. Some were pleased by the impromptu entertainment, while others were falling in "love" with the William Wallace-wannabe. I didn't realize it then, but I was falling in love, too. 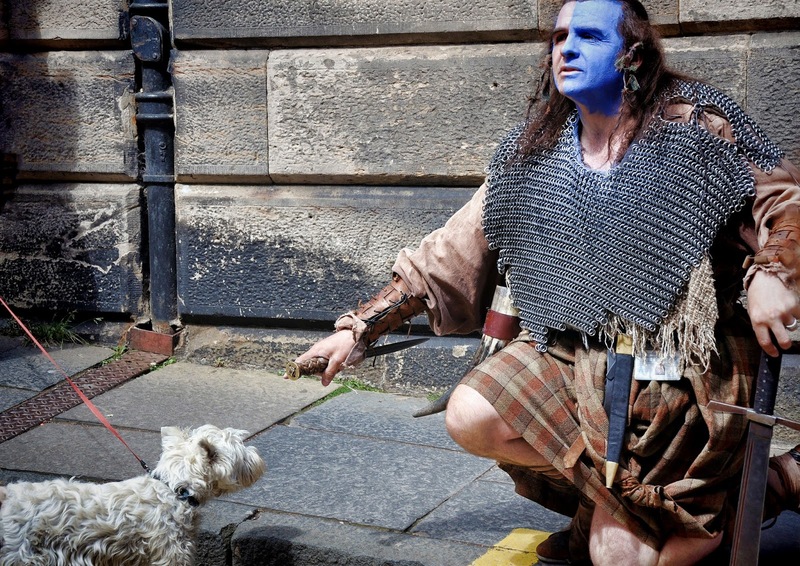 Not with the man in the kilt, but the dog on the leash. 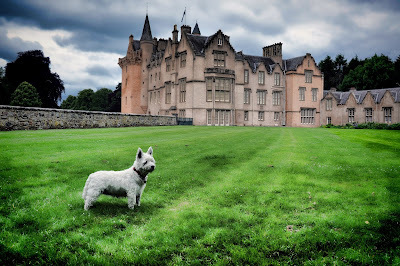 For me, the brave little Westie became my first Scottish love. Like a kid on a cross-country trip shouting out "slug bug" every time she sees a Volkswagen Beetle, I would search for the squat little dogs and squeal with glee each time I found one. 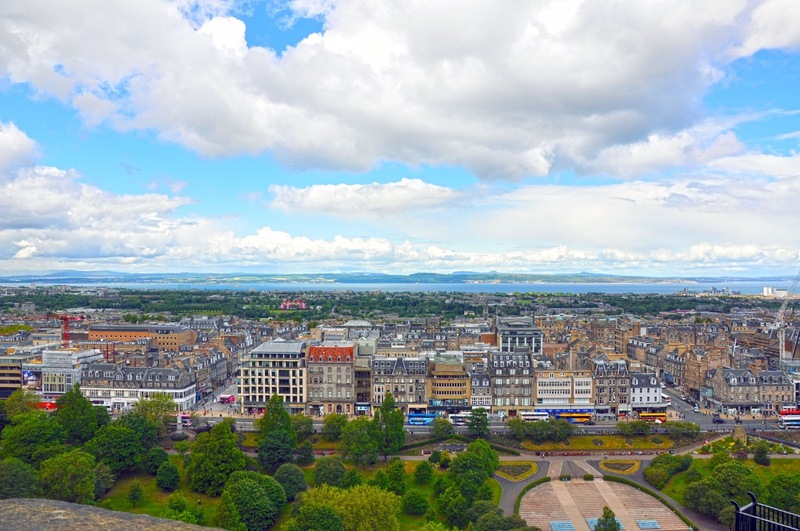 There are many things to love about Scotland: her verdant paps that appear to be blanketed in a quilt of golden gorse and purple heather, her finger-licking good crispy fish and chips, her potent Drambuie, her fascinating history peppered with fiercely loyal and courageous characters, and her warm, welcoming people. Any one of Scotland's appealing features can charm a tourist into yielding their heart. I enjoyed hiking her paps, eating her delicacies, sipping her liqueur, learning her history, but her scruffy little canines stole my heart and gave me some of my most treasured dragonfly moments. That's the amazing thing about travel, though, isn't it? No matter where you find yourself - a thatched hut in Honduras, a farmer's market in Omaha, a blueberry eating contest in Anchorage - if you take the time to look, you'll find something remarkable. a crazy American sprawled on his lawn, cooing at his dog. Illness has kept me from keeping up with your blog. I made up for it today by reading all of the posts I've missed. And how I have missed them. Your words always make me feel. Thank you. Hello Leah Marie. You probably don't remember me. We met at the airport in Philadelphia. You were on your way to Ireland and I was lost. You were so helpful to me. I knew even before cominf to youre blog that you had to be a caring person. This blog entry is so positive and that is the way I thought you were. Thank you again. I hope you had a good time in Ireland. This is a beautifully written posting that reflects your obvious innerbeauty.